Day 7: Final Forest Finished! Well, it wasn’t the most restful night of sleep with all the noise coming along the highway and in front of the store. Given the options, I was quite glad that I chose to sleep there. 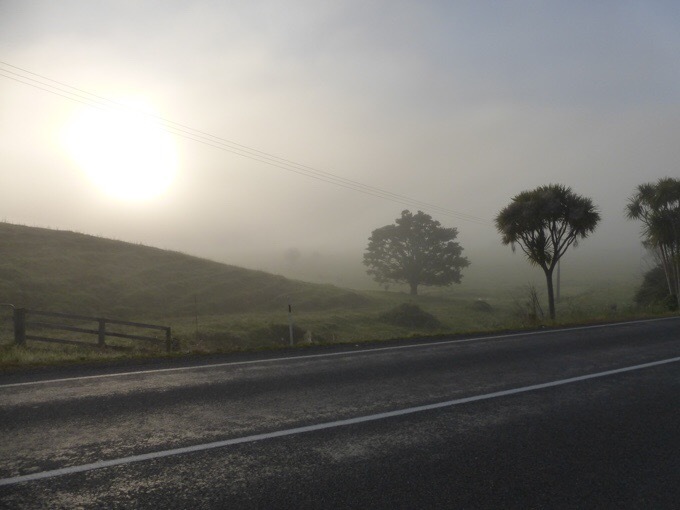 Overnight, there was a drop in temperature and a thick fog settled. The grass got extremely wet, and when I woke up in the middle of the night to use the outside toilet, I couldn’t even see across the street the fog was so thick. It would’ve been really rough to have to camp in that and have everything be really wet in the morning in tall grass. 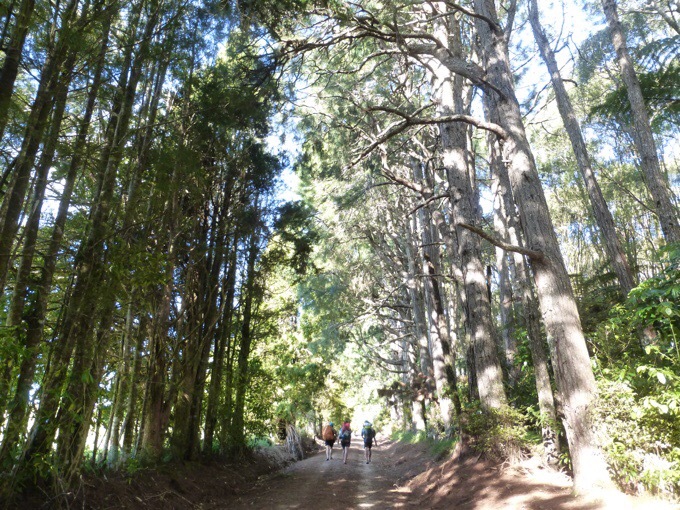 This trail is interesting and will provide some creative overnight experiences I’m sure. The other option to staying there would have been to maybe knock on someone’s door that had a farm and ask to camp in their yard. I know someone that did that the previous night, but I know I don’t want to rely on that, and if there is a more honest option that I can reach, even if it is a little bit of money, I will try to do those. Morning fog on the road walk. Today was an off day with my photos. I had opportunities for better shots and either spaced on it or was distracted. I slept in a bit after the long day yesterday, and got going just before 7am. It was a bit more of the highway walking, and then it forked off onto a dirt and gravel road for the rest of the morning. I really enjoyed the morning walking, and it was quite relaxing. Since the road was dirt and gravel, it was just as good on the feet as walking on the trail. 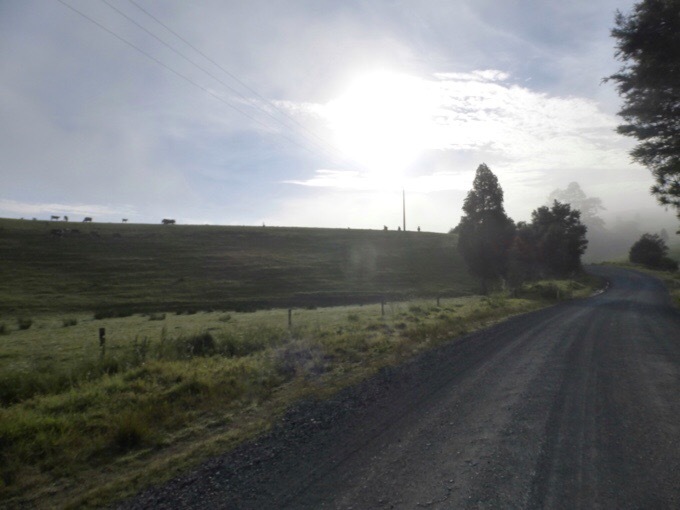 I enjoyed the quiet morning with few cars on the gravel road while watching the fog slowly burn off the rolling hills. Where I stayed last night, there was no available water unless it was purchased. They run off the rainwater, like many places around here, so that is very understandable because it is in limited supply. They can’t give it to every hiker that comes by. I knew I needed to grab more on the morning walk out, but I kept passing options that would require a scramble down into tall wet grass to water that was downstream of a ton of cows and very muddy looking. I would take it if I had to, but kept walking since I had a liter and hoped for better options as I walked. 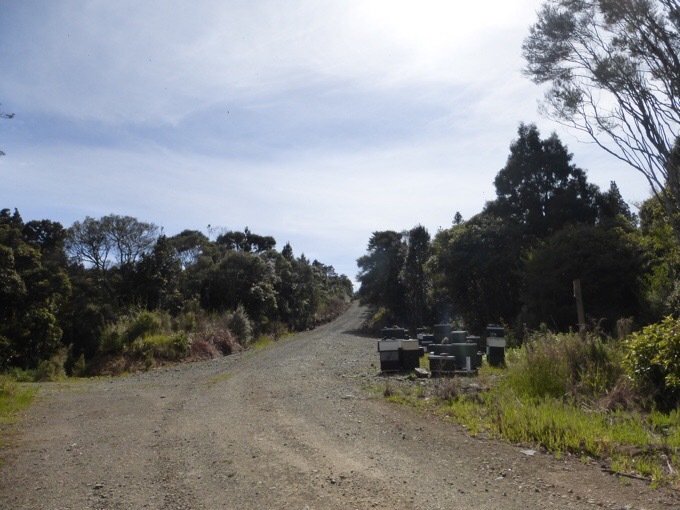 Just as I reached my final option, a farmer came down the road on a four-wheel-drive vehicle. I stopped him and asked him if there were better sources up the road where I was headed. He said I could just go back a bit and he would take me up to his farm where I could get water out of the tap. Score! I jumped on the four wheeler with him and we rode back up the hill to his farm where I was quickly able to grab water and then head back down the hill to continue on with clean tap water. 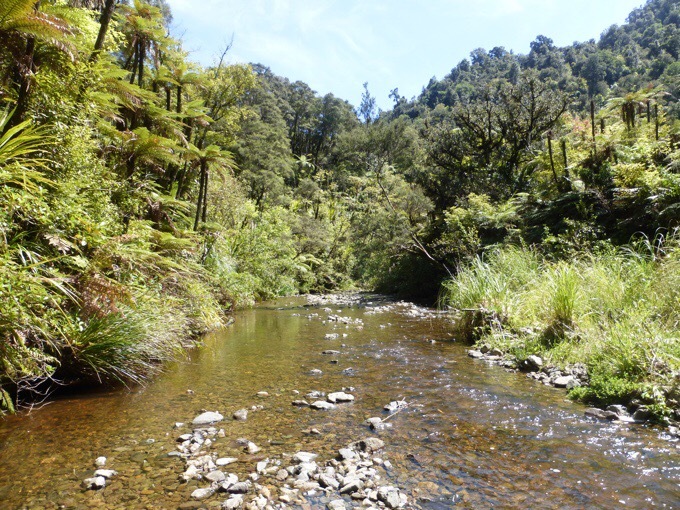 Today was the excitement of the Mangapukahukahu Gorge. 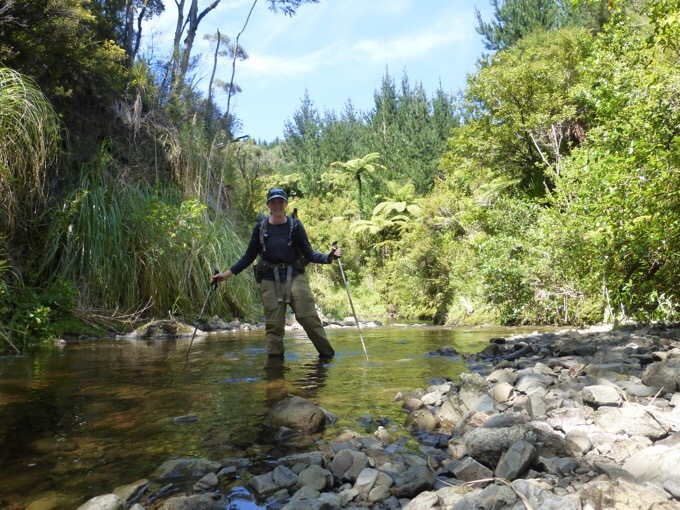 A 1.5mi/2.5km stretch of wading through a stream, going from bank to bank where possible. There is an alternate when it rains as it is subject to flash flooding. I had a lot of fun with it, and the timing worked great. The highest the water got was just above my knee for brief moments, but there wasn’t much of a current at all, so it was fine. Tomorrow night, rain is in the forecast, and I’m pretty happy to have gotten through the forests without rain! One warning to people going southbound. 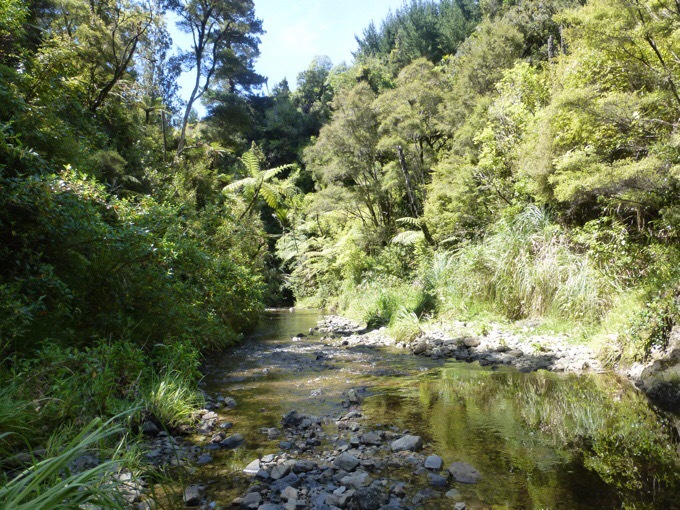 At the end, it comes to a T-junction with the Waipapa River. Crossing the river at the junction would require swimming, but there is a trail some miss just before the junction that will take you downstream to a better crossing point that is more shallow. I ate lunch after the final crossing and sat along the river and let my pants and shoes dry. It was a great lunch. 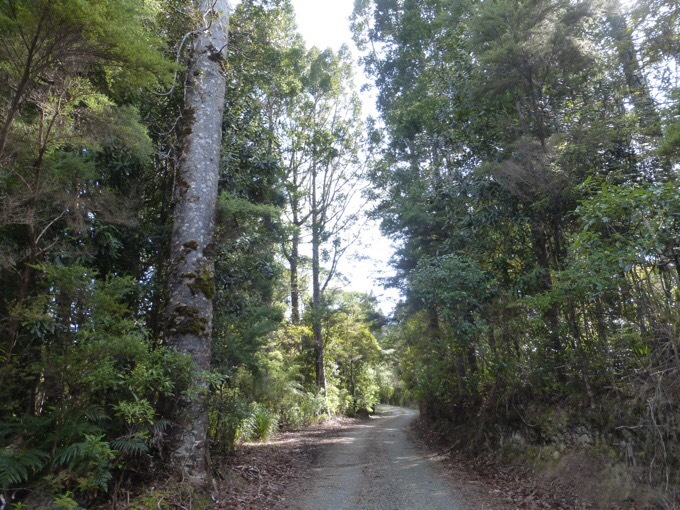 Next up was the final forest section through the Omahuta and Puketi Forest forests. There wasn’t much info on how long this would take, but I hoped to get all the way through it today. It started out worrisome with about an hour of strenuous side hill hiking along strongly eroded trail that went up and down constantly in short steep bursts. I was dripping sweat as it was quite humid out. I passed an older man I said a brief hello to (Jim from England) who was also quite drained by it. I was too focused on finishing the discomfort to stop and talk for long. 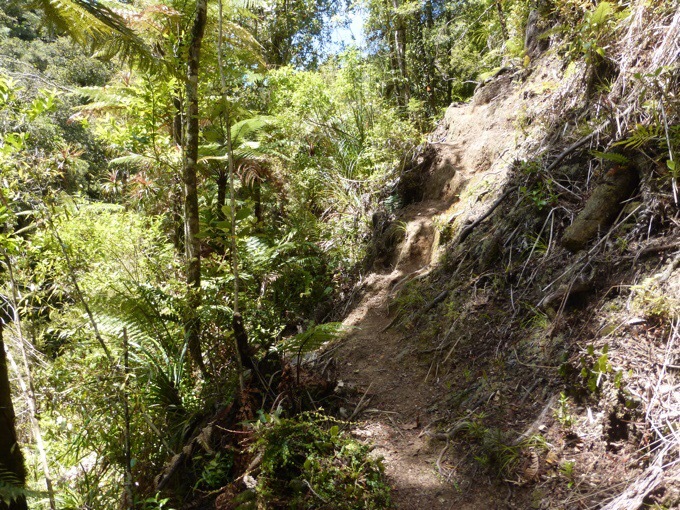 Fortunately, it changed to amazing trail once it reached a stretch called the Pukatea Ridge Track. I got one photo of the start of it with amazingly clear trail that was level, but went up quite steeply. 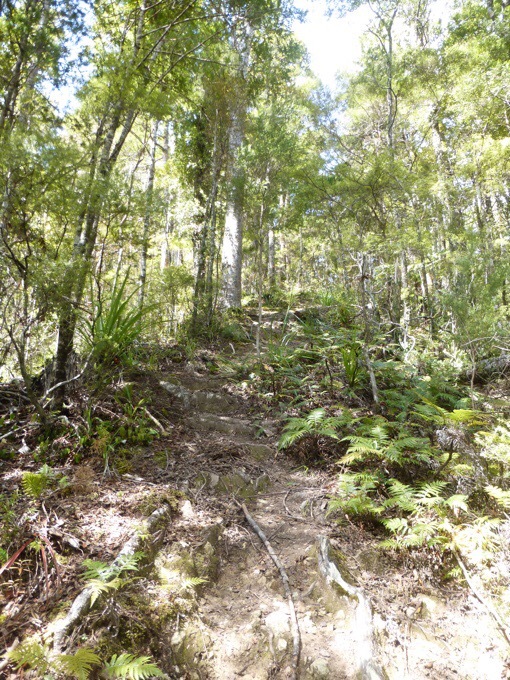 The start of the Pukatea Ridge Track. Soon after that, I came upon the first of many hikers I’d meet today. I ran into three young and well energized (both in body and spirit) hikers. A German couple named Jo and Michael, and a Chilean gal named Claudia. I walked the remaining few hours of the day with them and was quite entertained. 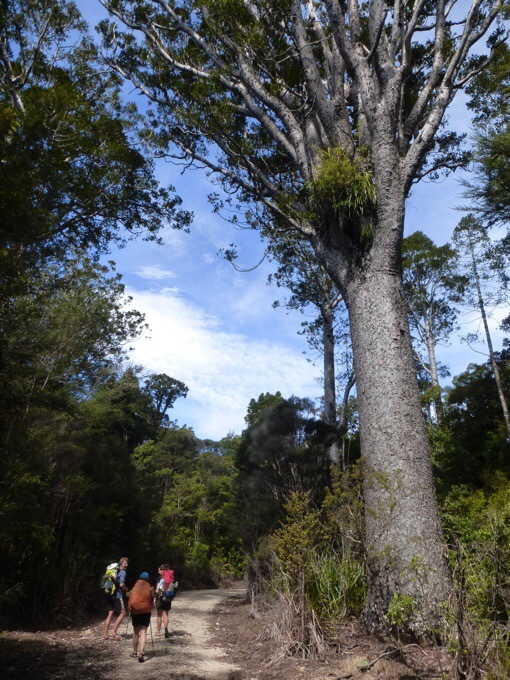 I forgot to get another photo of the ridge hiking, but we all loved it and it was the perfect dry forested trail. 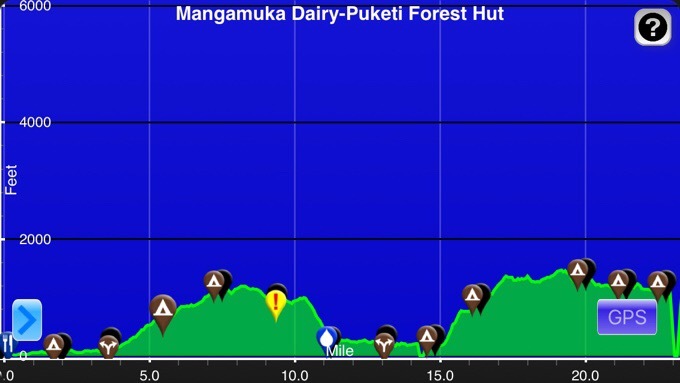 Earlier than we expected, it changed over to more of a hard packed dirt and rock road walk to the Puketi Hut. It was fun to be able to walk as a group the final two hours and talk. The time passed quite quickly. Jo and Michael just finished schooling in engineering and ecology. They have made almost all their own ultralight gear, are going with no electronics (except a microphone to record bird sounds as they are birders), and are obviously best friends and a great couple out here for an adventure together. It turns out Michael is the one with the Five Fingers shoes that look like bare feet. They even did the first forest with no shoes at all and he showed me the bottom of his foot covered in at least 30 small splinters. Crazy that they’d do a forest barefoot! Claudia was hilarious including telling me how exhausted she was, but showing me how she learned from another hiker to never outwardly show weakness, so this is her, “I’m tired, but not going to show it face” at the end of the day. The whole second half of the day, there were many traps along the trail for possums, rats, and mustelids(weasels). As we walked the road, we saw what was either a possum or mustelid dead in a trap. It was weird to see. 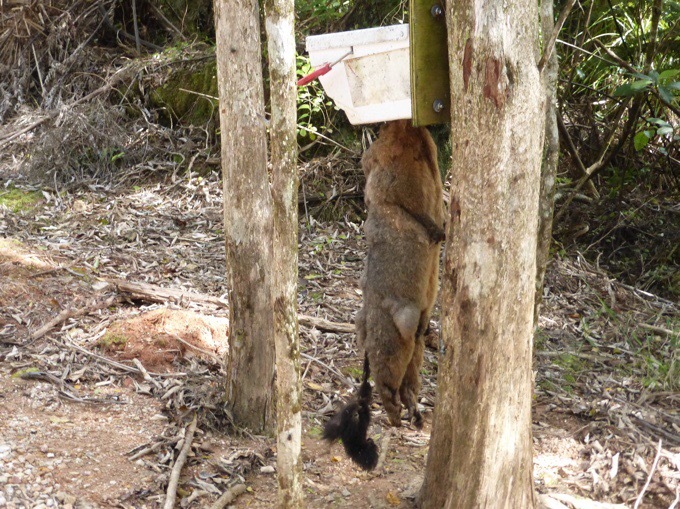 There is a hole in the bottom of this container and when they stick their head in it for the food, apparently it breaks their neck and they hang there. Hard to look at. 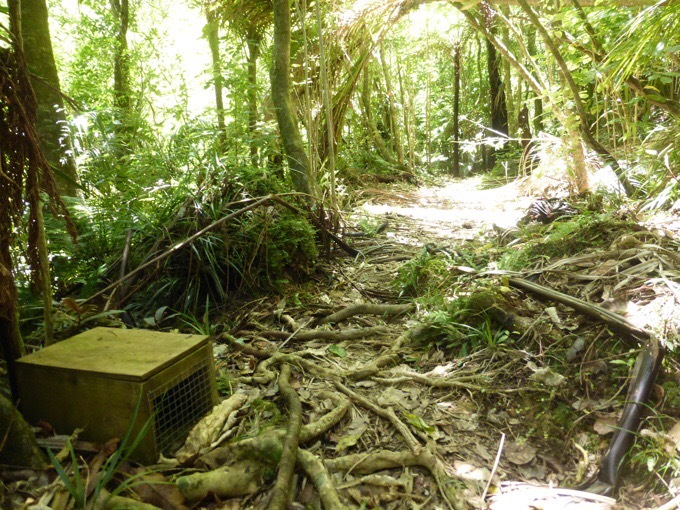 One of countless possum traps along the track. I think that’s a mustelid. 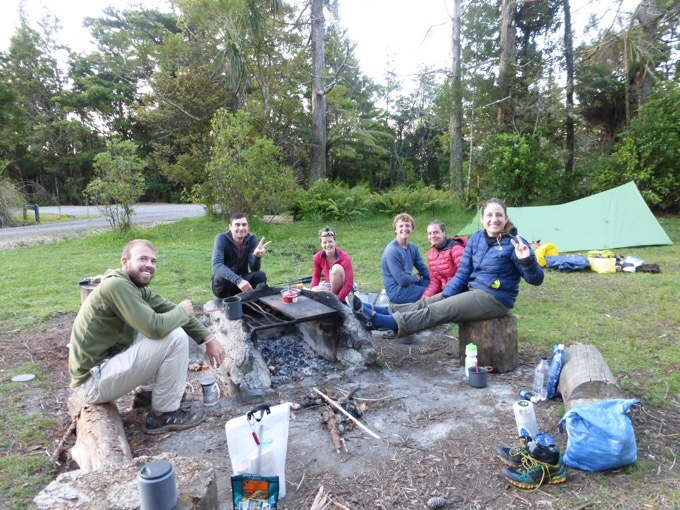 We got to camp at 5:30pm to meet four other hikers they already knew and had been leapfrogging with for awhile. It’s a drive up camping area as well, so there were facilities. It was $6 to camp and was a nice big area with plenty of space. The whole group is quite young and positive. I’m just amazed at how nice people are. There is a different vibe out here than on American trails. Everyone is one group rather than cliques and it’s really cool. There isn’t any exclusion and everyone is just really nice. Also, the only people I’ve seen interested in getting high or smoking a cigarette have both been Americans. There just hasn’t been that party atmosphere here and I really like that. I think this trail just hasn’t allowed for it yet with how tiring and demanding it can be. Will, John, Anna, Michael, Jo, Claudia. I got to my tent pretty late after dinner with the group and I took photos of everyone with their tents. As it was getting dark. The older man, Jim (63yrs old), I passed this morning showed up. Most of the group is in their 20s and they all started from the same campsite this morning agreeing that it was a difficult hike today. When he arrived late everyone was eating dinner and enthusiastically applauded his arrival and cheered. It was pretty awesome to see such a supportive and welcoming young group. Even later, Becky, who I stayed with last night, arrived. Quite the group. 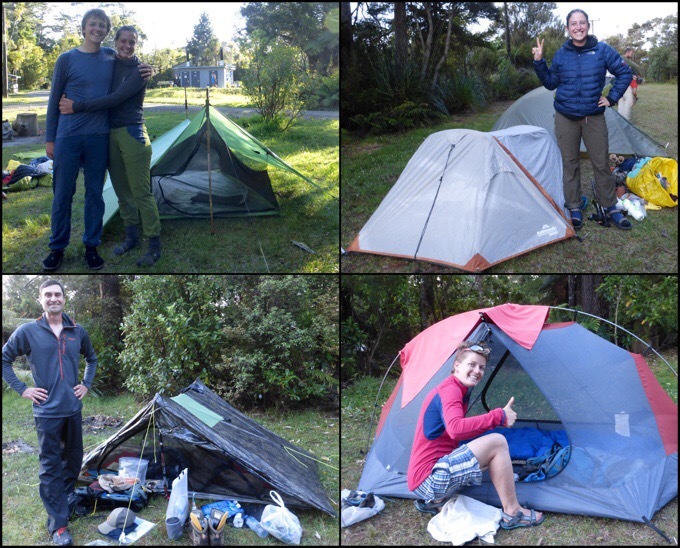 Clockwise: Michael and Jo, Germany, homemade; Claudia, Chile, Kathmandu Mono; Anna, France, didn’t get the name; John, US, ZPacks Duplex. 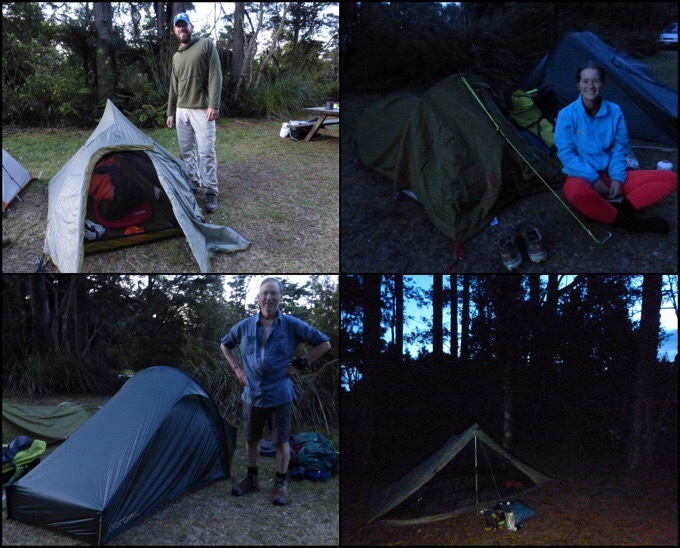 Clockwise: Will, US, Big Agnes Seedhouse SL1; Rebecca, Germany, Jack Wolfskin Gossamer; me, ZPacks Solplex; Jim, England, Nordisk Telemark. Well, I’m pretty happy to say I dodged the rain this leg! It is forecasted for the second half of tomorrow and overnight tomorrow when I’ll be in town, perfect! The forests are conquered! Sounds like a great group to camp with. Fun to see the different equipment choices from around the world. Totally agree with using hiking sticks. Here they go, killing animals again .. not sure why? 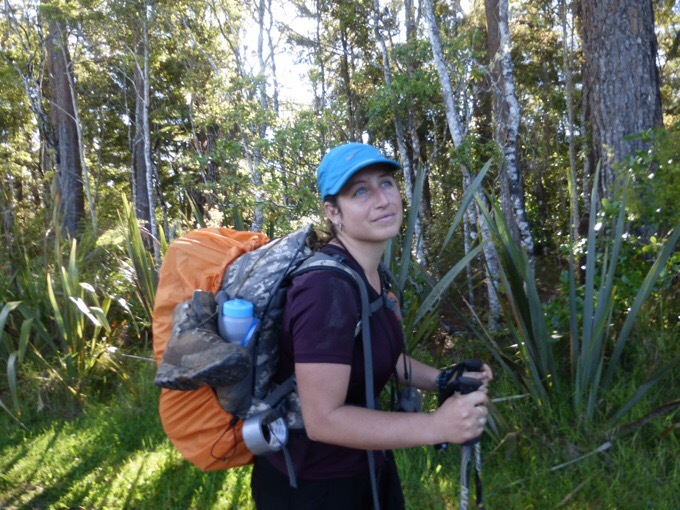 Most impressed as always, with your willingness to go wading, Erin! The unfortunate hanging critter isn’t a possum.. I love how you are meeting so many great hikers!! Nice that you are helping to represent the U.S.
One bright ? note from the election.. California passed the $2 a pack tax on cigarettes, also facing vapes. This despite a massive campaign by the big tobacco companies. In other states, taxes like this Have resulted in a significant drop in very young smokers. I think I would definitely use hiking poles if I was to hike! Have you ever read the books by the Barefoot Sisters… they hiked the AT.. barefoot.. ?difficult to imagine. Yeah, I heard about them. Quite another breed those barefoot walkers! Erin, you just keep on dodging all the rain! I need your skillz! Glad you are having fun and enjoying the international crowd. BTW, check out the “IT Crowd”. A very funny BBC half-hour comedy.